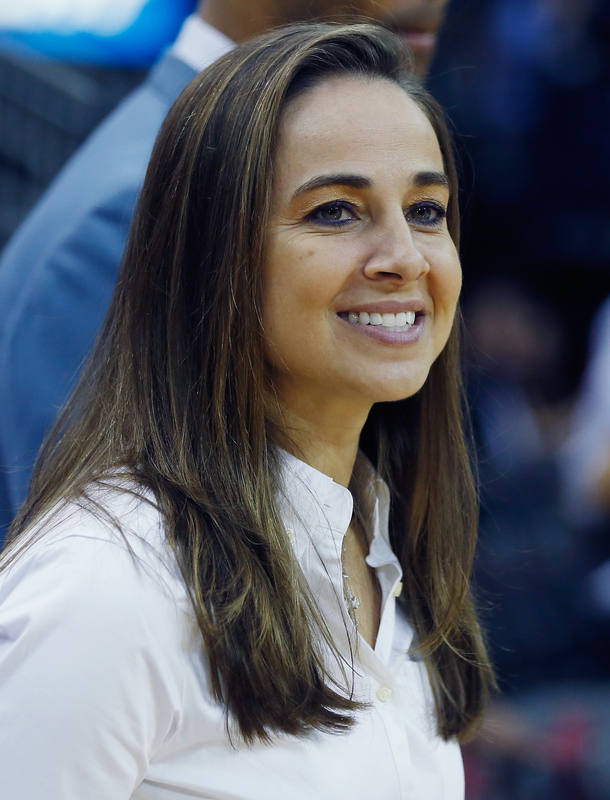 The world is still celebrating Becky Hammon and her win as the first woman to coach an NBA summer league team, which was freaking awesome. But Hammon isn't the only awesome woman in the sports world that you might not have heard of before now — not by a long shot. Although sports is an unquestionably male-dominated field, there are and have always been women involved in sports, as well — as athletes, coaches, referees, reporters, you name it. In the past, women were frequently overlooked during their own time and not remembered in the same way their male counterparts were — and indeed things are still pretty unfair today. Women are still denied the same access, recognition, and money that men tend to get in the sports world. But those obstacles don't mean that women aren't participating in the world of sports; quite the opposite. More and more, women are blazing new trails to make the world of sports a more equal place, and even though there is a long way still left to go on that front, the door opens a little wider every time a woman marks another historic first. For instance: Becky Hammon just won an NBA summer league championship, and now the NBA commissioner himself is talking about the prospect of seeing female coaches in the league. So in honor of Hammon's victory, here are 12 other women who have achieved notable "firsts" in sports, thereby moving us all that much further forward. This year, Amélie Mauresmo became the first woman to coach a male professional tennis player when British star Andy Murray hired her. Mauresmo is a French former number one women's player with several Grand Slam titles and an Olympic medal to her name, though that didn't stop a lot of people from acting like it was ridiculous to assume she could possibly teach a male player anything. However, Murray said that seeing all the sexist backlash made him become a feminist, so it seems Mauresmo is changing things all over the place. It isn't just current or former players who can change the face of sports; announcers are a crucial part of the sports world as well. The first female sports anchor to ever appear on ESPN (and one of the first to appear anywhere on television), Rhonda Glenn, passed away this year at 68, but her contribution will never be forgotten. The former amateur golfer worked at ESPN for two years and paved the way for all the women who came after. Earlier this year, 16-year-old French baseball player Melissa Mayeux became the first woman to be named to Major League Baseball’s international registration list, which means that she is eligible to be drafted by a professional team — and could therefore also become the first female player in Major League Baseball history. But even if that doesn't happen, she's already set a pretty phenomenal precedent. Alice Coachman was the first African American woman to win an Olympic gold medal, and also the only American woman to win a gold during the 1948 Olympics in London (she won for the high jump in the track and field competition). Coachman went on to become a national celebrity, meeting President Truman and becoming the first black woman to endorse an international product (Coca Cola). She also was instrumental in paving the way for other black women in track and field, such as Jackie Joyner-Kersee. Coachman passed away in 2014. Jackie Mitchell was a 17-year-old pitcher who was the first person to strike out baseball stars Babe Ruth and Lou Gehrig back-to-back. Calling it a "first" is a little misleading, though, since she was also the only person to ever achieve such a thing. Although there has been speculation that the strike outs were orchestrated as part of an exhibition and weren't genuine, Babe Ruth's extremely angry reaction suggests he at least wasn't in on the plan. And the fact that women were banned from the major leagues not long after suggests one of the stars might have complained. Violet Palmer became the first female referee in the NBA in 1997, and has been doing the job for 18 seasons and a total of 904 regular-season games. She's also paved the way for other female referees in the sport, because she is awesome. "They cracked the door and I just took my foot and kicked it wide open," Palmer told Newsday this year. It seems hard to believe there was ever a time when women weren't even considered possible team owners (isn't the only qualification for that having lots of money and having basic business sense? ), but until Georgia Frontiere inherited the Rams NFL franchise in 1979, no woman had. Frontiere owned the team for 28 years and was responsible for the controversial decision to move the team to St. Louis. She passed away in 2008. It's worth remembering that women were making history in sports long before the 20th century. Case and point: Alicia Meynell, who became the first female jockey in 1804 in England. Although more and more women are getting the chance to break into sports media, the road remains difficult, and doubly so for women of color. Angela Sun is a host of Yahoo! Sports Minute and was the first Asian American sportscaster to host a show on ESPN. Although the world of women's mixed martial arts is nowhere near as big as the men's, in 2009, there was a major MMA event between two female fighters in 2009, the first two women headlined a major MMA event. Gina Carano bested Christine Justino, making her the first female victor of a major MMA fight, though Justinto also deserves credit as a trailblazer as well. Paving the way for superstars Serena and Venus Williams, Althea Gibson was the first black player to cross the color line in international tennis, and in 1956 became the first person of color, man or woman, to win a Grand Slam title when she won the French Open. Over the course of her career, she won an impressive 11 Grand Slam titles, and was inducted into the International Tennis Hall of Fame. She also had a professional golf career, because nothing could hold this woman back. If you haven't heard of Mo'ne Davis, you need to start paying attention. In 2014, Davis became the first female pitcher to win a Little League World Series game — and then promptly also became the first girl to pitch a shutout in a Little League World Series game. And she's shows no sign of becoming less awesome any time soon. Watch out for this girl to be a super star and keep blasting doors open wherever she goes.